Yaniv Rodenski introduces Hadoop, then running Hadoop on Azure and the available tools and frameworks. Glenn Block demoes deploying Node.js apps with npm to Windows Azure, leveraging storage and service bus services. Mark Rendle introduces the basic services offered by Windows Azure along with examples of various platform choices that can be used: RavenDB, ASP.NET MVC, Node.js + Express, MongoDB, Sinatra, etc. Yves Reynhout discusses event sourcing and storage, demoing implementing a conceptual event storage model on top of AWS Storage and Azure Storage Services. 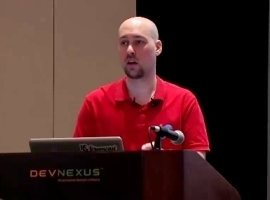 Joe Feser discusses how to enhance a legacy application into a disconnected hybrid app using Pub/Sub capabilities of the Windows Azure Service Bus.